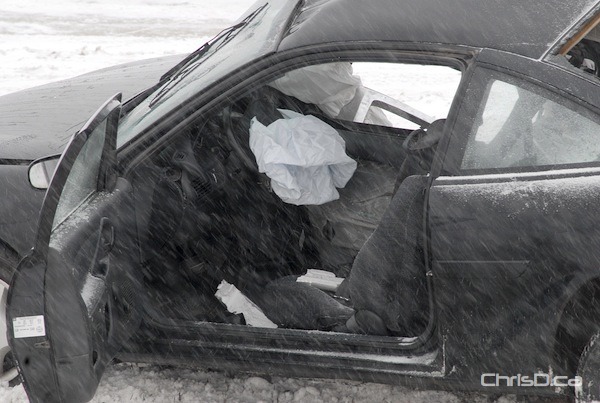 A 54-year-old Winnipeg woman was killed Tuesday in a two-vehicle crash on the Perimeter Highway just east of Highway 59. The crash happened just before 7:30 a.m. when the woman lost control of her 2005 Chevrolet Cavalier heading west and crossed into the path of an eastbound Dodge pickup truck. The woman was taken to hospital, where she was pronounced deceased. Her name isn’t being released. The male driver of the pickup was taken to hospital with minor injuries. Road conditions at the time were reported to be extremely icy. Police also responded to several more crashes in and around Winnipeg during the Tuesday morning commute. Factor in the fog patches and flurries, and motorists had a tricky drive after the long weekend. The weather also had numerous rural school divisions cancelling classes and bus service for the day. Late Monday, Environment Canada issued a snowfall warning for eastern Manitoba, including Steinbach, St. Adolphe and the Whiteshell region. Many areas are expected to receive 10-15 cm of snow by this afternoon.